When a cruise line has 26 ships in the fleet with even more on order or being constructed, it can be easy to lose track. Carnival Cruise Line is the largest cruise line in the world, and there are several different class ships with each being built and joining the fleet at different times. 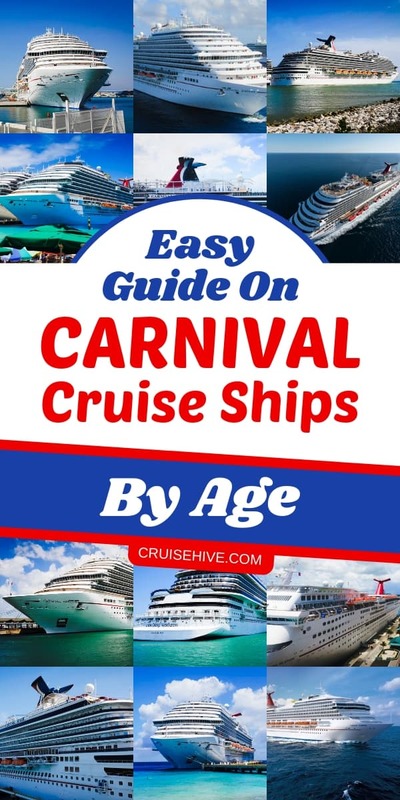 We’re going to keep track of the Carnival ships by age, so you don’t have to. Which is the Newest Carnival Cruise Ship? The very first Carnival cruise ship was the Mardi Gras, she wasn’t built for the cruise line but was the first ship for the newly formed Ted Arison Carnival Cruise Line at the time. The ship started sailing for Carnival in 1972 and ever since the “Fun Ships” have kept coming! Mardi Grad was over 27,200 gross tons which is a huge difference from the current newest ships in the fleet which is Carnival Horizon at 135,000 gross tons. However, Carnival Horizon will be replaced as the newest Carnival cruise ship when the Carnival Panorama joins the fleet in 2019, she will be the final Vista-class vessel. An even larger 180,000 gross ton fully powered LNG vessel arrives in 2020. We’ve already put together a list of the smallest to the largest Carnival cruise ships which you can take a look at here. Carnival Cruise Line goes back beyond the Carnival Fantasy, but all those cruise ships are no longer operated by the Miami-based cruise line or have been scrapped. The very first was Mardi Gras which we already mentioned further up and then came Carnivale which is, in fact, the oldest built ship. She didn’t start sailing for Carnival Cruise Line until 1975. Festivale was built in 1962 but joined the fleet in 1977. Tropical was the first new cruise ship built for Carnival Cruise Line in 1982. The new Holiday-class vessel also built for the cruise line helped grow the Fun ship fleet with Holiday arriving in 1985, Jubilee in 1986 and Celebration in 1987. We look forward to the future Carnival cruise ships with the new era of Liquefied Natural Gas (LNG) powered ships entering service. These new generation ships will grow Carnival even further bringing new features and innovation to the cruise vacation experience. Find out about all the things to do on the Carnival Glory cruise ship which is operated by Carnival Cruise Line. Covering specs and venues too! We've put together all these reasons to go on a Carnival Valor cruise vacation. Find out all the things to do on the Carnival Cruise Line operated ship. Find out all these ways and things to do on the Carnival Liberty cruise ship which is operated by Carnival Cruise Line along with tips while onboard.